D&P Haulage in Hull has been recognised by Palletways, Europe’s largest and fastest growing express palletised freight network, for its outstanding sales performance and the role it has played in the expansion of Palletways this year. D&P Haulage is one of more than 110 members that form the UK Palletways network. 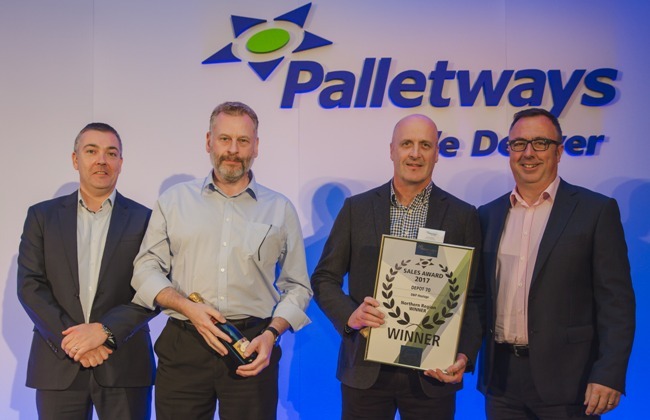 The company was announced as the Northern Region Winner in Palletways 2017 Sales Awards at its National Sales Conference. The Award marks twelve months of outstanding achievement in sales and marketing by D&P Haulage. D&P Haulage helped Palletways UK move a record breaking 5.4 million pallets – the biggest year for the network to date. The 2016/17 figure beat the previous year’s record by some 300,000 pallets. Dave Walmsley, Palletways UK managing director, said: “D&P Haulage has made a significant contribution to the strength of the network over the past 12 months and their efforts are well deserving of this award. D&P Haulage is one of over 110 independent transport providers that are part of the Palletways UK network. They benefit from shared expertise and resources from within the group to deliver consignments of palletised freight to market faster and more cost effectively than ever before. The Palletways Group comprises 400 depots and 14 hub operations, through which it provides collection and distribution services across 20 European countries, including the UK.